RUSH: Yesterday I said that the Democrats had a golden opportunity. With the House Intelligence Committee chaired by Devin Nunes and run by the Republicans with the House Intelligence Committee announcing the end of their investigation into collusion between Trump and Russia to affect the election because they found no evidence. They have interviewed 73 witnesses, done tens of thousands of hours of interviews. They haven’t a shred of evidence. They ended the investigation. Nothing to see here. And I said, “This is a golden opportunity for Pencil Neck, Adam ‘Shifty’ Schiff, ’cause now all he’s got to do — all he has to do — is find the tiniest shred of evidence, and he can nuke the Republicans. He can embarrass them. He can expose them for partisan fruitcakes. 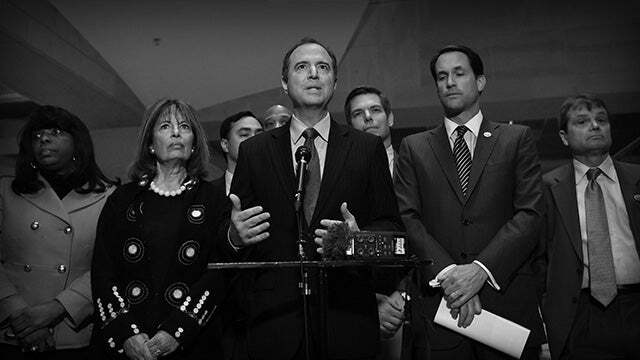 All he’s got to do is come up with some evidence now!” Now, Schiff… From the beginning of the first days of this committee being impaneled and beginning this investigation, Schiff has made it clear that he hasn’t seen any evidence of collusion yet. What? What? What? Where is the significant evidence, then? I mean the headline says “cite evidence.” That must mean Schiff has it. Where’s the “significant evidence”? I mean, the headline clearly says, “House Democrats Cite Evidence of Trump-Russia Collusion.” Pencil Neck “who saw the GOP report for the first time on Tuesday, said Democrats on the committee would try to continue the investigation where possible and would write their own report to lay out conclusions from the intelligence panel’s yearlong investigation into Russian meddling. “As examples of evidence of coordination, [Pencil Neck] cited multiple contacts between Trump’s campaign and Russia, including a meeting in Trump Tower in June 2016 and information passed on to an Australian diplomat” with ties to the Clinton foundation, “by a former Trump campaign aide George Papadopolous [sic], that the Russians had…” So he doesn’t have any new evidence. He doesn’t have anything. You know what he’s doing? There isn’t any evidence. He’s got evidence? Meetings, about which there’s no new information. “Schiff also signaled that he would reopen or begin certain lines of inquiry if Democrats retake the majority of the House this November.” Now, that’s for sure. And, if they do win the House, it will begin the Mother of All Witch Hunts, and it will be coordinated with the Mother of All Impeachment Efforts. So Pencil Neck doesn’t have any new evidence. There isn’t any evidence exhibited or otherwise. But he got the AP to write a story with the headline: “House Democrats Cite Evidence of Trump-Russia Collusion.” And then we have a fun little story, Washington Examiner. “Adam Schiff’s TV Career at Risk After GOP Shuts Down Russia Probe.” (chuckling) Do you know this guy was on 227 TV interviews in 13 months? Hang on. What is 227 divided by 13? Let me do it again. What is 227 divided by 13? It’s 17 a day! Seventeen! Can that be…? Yeah, 227 interviews during the year, 13 months. So 27 a month. Twenty-seven interviews a month Pencil Neck did. It says here “Schiff was outraged at the decision, and made it clear that Democrats would continue to plug away at their collusion theory… But Nunes’ move will likely marginalize those efforts, which left some gleeful Republicans predicting they might soon be seeing less of Schiff on TV.” I doubt that. I don’t think Schiff’s gonna… He may be a little bit less, but he remains the go-to guy for the media to continue the myth.